Gardenia, also known as cape jasmine, is a perennial shrub commonly grown for its large, fragrant flowers, glossy foliage and ease of care in a container. The plant blooms during late spring and summer, producing numerous white, aromatic flowers. Gardenia reaches up to 6 feet tall if provided proper space, though most potted plants only reach 3 to 4 feet in height. 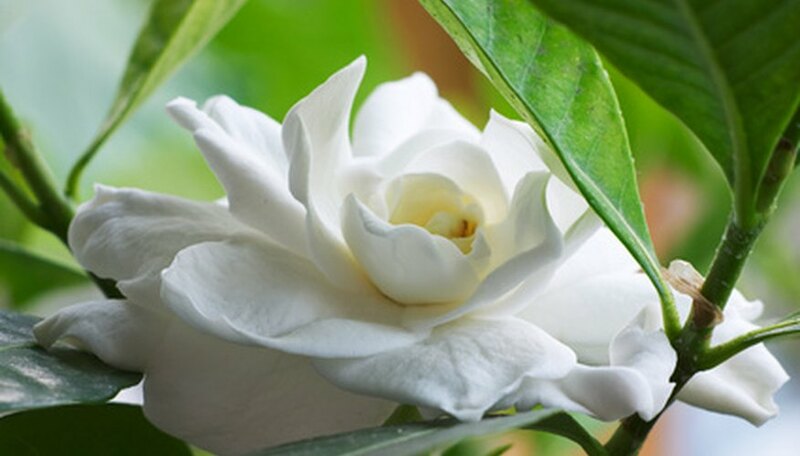 Native to Asia, gardenias require a warm, humid environment to thrive. Because of their tropical origins, American gardeners typically grow them in containers to more easily emulate their native habitat. Keep your gardenia potted plant in a location that receives bright, direct sunlight for at least six hours a day. Maintain a temperature of 68 to 74 degrees F during the day and 60 degrees F at night for optimal growth. Run a humidifier near the plant at all times to raise the relative humidity. Replenish the water in the humidifier whenever necessary. Alternatively, mist the plant twice per day using a spray bottle filled with lukewarm water, though this method increases the risk of disease. Water gardenia whenever the top inch of soil is completely dry, about once every five to seven days. Reduce watering frequency to once every 10 days during winter, when the plant is dormant. Apply water directly to the soil to keep the foliage dry. Feed your gardenia potted plant once per month from April to November using a balanced 10-10-10 NPK acidic fertilizer. Water the plant just after fertilizing to dissolve the fertilizer. Apply at the rate recommended by the manufacturer. Do not feed during December through March, as the plant requires fewer nutrients during this time. Re-pot the gardenia plant once every two to three years, or whenever the plant appears crowded in its current container. Increase the size of the new pot by 3 to 5 inches to provide room for new growth, and provide a fresh growing medium to ease the shock of transplanting. Gardenia prefers spending warm spring, summer and early fall weather outdoors, as long as the temperature stays above 50 degrees F. Bring indoors anytime the temperature drops below this point. Prune gardenia during late winter, just before new growth begins, if it begins to grow in a non-compact habit.